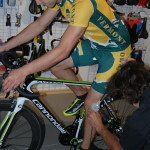 Our fitting professionals provide comprehensive analysis of your relationship with your bicycle. With over 20 years of professional fitting experience our Master Fit Technician, Tom Stevens, provides an unequaled experience in fitting your bike to your specific needs. 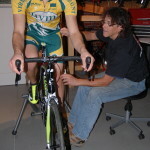 STEP TWO in the fitting process is a dynamic bicycle fitting (done with the rider on a stationary trainer to simulate the actual riding experience.) This process fits the bike to the rider in all three dimensions. This process typically takes about 3 hours and includes a FIT FOLLOW UP as needed to fine tune the overall Fitting process. The shop does a preliminary fitting with the sale of every bicycle.